From modern craft cocktails to old standbys, prepare to shake, stir, and just plain pour your way through some of the best wax ever pressed. Wickedly designed and featuring photography throughout, Booze & Vinyl is organized by mood, from Rock to Chill, Dance, and Seduce. Each entry has liner notes that underscore the album's musical highlights and accompanying "Side A" and "Side B" cocktail recipes that complement the music's mood, imagery in the lyrics, or connect the drink to the artist. This is your guide to a rich listening session for one, two, or more. André and Tenaya Darlington are coauthors of The New Cocktail Hour and Turner Classic Movies: Movie Night Menus. They grew up flipping their parents' records on a Thorens turntable. Follow them at www.thedarlingtons.com. Tenaya is a food writer, blogger, journalist, and educator in Philadelphia. She pens the blog Madame Fromage (madamefromageblog.com) and is the author of The Di Bruno Bros. House of Cheese. By day, she teaches writing at Saint Joseph's University. ". . . a unique take that grabs your attention like a record scratch in a monotony of drink books." "Listening to the entire Rise and Fall of Ziggy Stardust LP, side A then side B, would be that much better with a perfectly paired cocktail. Purple Rain, too. 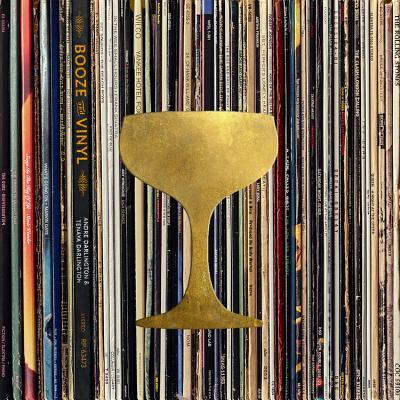 Booze & Vinyl goes in deep on years of classic music with drink recipes to match."